Actually, there is a Nasturtium Alaska plant that does have variegated leaves, but I have not seen them, so could not be sure of what you have. However, if anyone asks what is wrong with the flowers just toss your hair back and say, "Oh, those are Nasturtium Alaskans, variegated you know!" As mya stated there is a variegated Nasturtium called "Alaska" and another variegated one I found at Renee's Garden called " Amazon jewel"
let me know how it turns out, it appears that either one will be pretty. If stress causes variegation I would be pretty variegated myself! I have seen some nasturtiums like that... I think mya and vetsy are right about it being alaska. I found the seed packet. Doh. It was Alaska! Good call Vetsy. You have an infestation of geranium leaf miner. Sorry to tell you! It's been awhile since I've visited your blog; glad to see you're still writing! Dang. Just found your site and was going to post an answer. 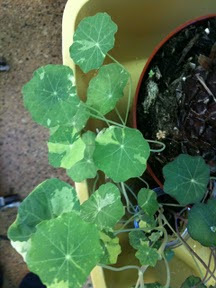 Are all nasturtiums edible? I've eaten the seeds, but not into the petals just yet! You are right about the leaf miner. Argh.